There has been a long-running debate in the string-playing world regarding the ‘Golden Age’ of string playing, generally considered to span the 1920s to the 1960s. While many today are happy to listen to and model their playing on more contemporary players, there has been a persistent argument made that the players of that era—Heifetz, Feuermann, Kreisler, Oistrach, Casals, and numerous others—played in a different way than more recent players. It is easy to dismiss this argument as the eternal ‘nothing is as good as it used to be’ meme and, when painted with too broad a brush, such generalizations quickly fall apart. The string players of that era were, after all, a group of vividly different players with different approaches—as are today’s players. Yet when one begins to examine the specifics of the playing of the leading musicians of that era and contrast it to much of what has followed, it is undeniably clear that much in the general approach to phrasing has changed. Through the lens of time, we can see commonalities of approach in the diverse players of this ‘old school’ when contrasted with the approach of many modern players. The point of this article is not to debate which is preferable—ultimately a matter of personal taste—but only to consider, at least in one case, what actually was different. We spend much of our time, in practice and in teaching, trying to solve technical problems. We’ve been remarkably successful at it, as witnessed by the general agreement that the average technical standard has risen considerably over the last 50 years. But in general, is as much attention devoted to the logic of phrasing as to the building of technical facility? Even teachers with the greatest musical instincts are loathe to press their musical ideas on their students for fear of squashing their budding instincts, and we often lack the terminology and practice to discuss principles of phrasing in broader, less personal terms. Young players today naturally want to idolize and emulate those who are currently successful and we live in an era where superlatives are plastered on performers almost indiscriminately so that even thoughtful, measured criticism of our peers raises suspicions of jealousy or arrogance on the part of the critic. Performances today are rarely analyzed and criticized in the open, but by publicly holding all approaches equally valid, we risk draining music of much of its vitality and honesty. If every performance of our leading performers is unquestioningly deemed ‘amazing’, we ultimately cheapen the value of all interpretations. We improve our own playing and our art by critiquing ourselves and others; why should we fear to do this for phrasing as we do for technical issues? Is enough attention given to teaching students to listen carefully to their phrasing, ensuring that they understand the logic of the lines and that what they produce isn’t marred by careless technical habits? Are all of our most promising young virtuosi taught to refine their native instincts so that they perform for the audience rather than simply performing in front of it? This becomes even more crucial when the starting point for many young players’ familiarity with major works is often not the score, but famous recordings, which are sometimes heard so frequently that the recorded artist’s personal interpretation becomes inseparably intertwined with the music. Recordings are an invaluable learning tool, but they also pose the danger that we become a musical version of the game ‘telephone’, where each successive generation’s version becomes not an interpretation of the original score, but of whatever was most known and successful at the time. 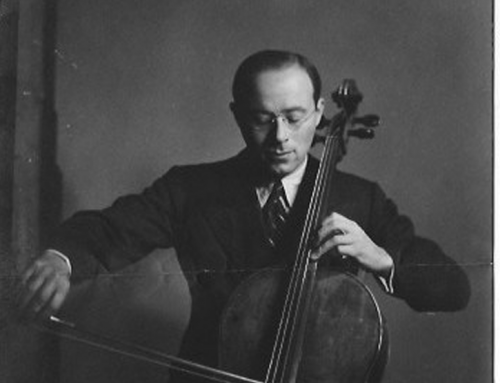 Emanuel Feuermann’s life was cut short by a surgical mishap at age 39 in 1942, just as he was securing his reputation as the greatest living cellist and the heir apparent to Casals. Because of his early death, Feuermann had a limited impact on the generation of cellists that followed. 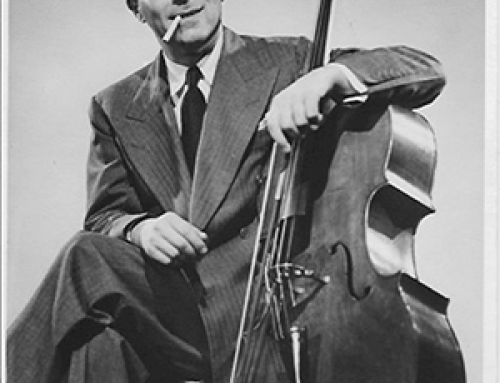 And yet, in the course of interviewing cellists who had heard him play, I found that despite the legion of very successful, world-renowned artists that followed him, there was unanimous consent that Feuermann was the greatest cellist they had ever heard. If we were to consider only the technical side of Feuermann’s playing, an argument could possibly be made that Feuermann was a pioneer rather than an anomaly. Feuermann was clearly a technical revolution, playing the cello with the ease of a violin in a way that was unprecedented, but browsing Youtube today we can find many modern cellists—most relatively unknown—accomplishing bravura technical feats with the cello in a way that was certainly less commonplace during the ‘golden age’ of string playing. If no one has quite matched Feuermann’s fluidity, it could be argued that more cellists come closer today than in his time. However listening to his recordings, we can quickly hear that Feuermann’s accomplishment was not simply gifted athleticism on the cello, but the ability to use that facility in the service of the phrase in a most natural and beautiful way. And it is in this aspect that most who knew Feuermann felt he had no peer. Comparing the details of Feuermann’s recordings with those of other cellists, several consistent differences stand out. These details blend together to create the je ne sais quoi reaction that we usually feel instinctually in comparing two cellists’ performance, though we don’t always have the time to go into more detailed analysis of the causes. The ideas presented here only scratch the surface of what could be discovered and discussed, but I’ve found that even this limited analysis has caused me to rethink my approach to music in recent years. One of the first and most obvious features noted in most of Feuermann’s recordings is the quick tempi, a trait he shared with many of his contemporaries. Feuermann’s recordings of the Dvorak concerto, for example, are between 5 and 10 minutes shorter than most modern accounts, though his tempi only occasionally push faster than Dvorak’s indications. Instead, it is the modern tempi to which we are accustomed that more often lag behind Dvorak’s tempi—in some sections by as much as 20-40 bpm! This is a fairly widespread issue in modern interpretive practice (How often do we hear the complaint that a given composer must have had a ‘faulty metronome’?) The choice of tempo is a personal interpretive decision, but different tempo choices will undeniably produce a different perception of the music for the listener. Just as our perception of the landscape varies when walking rather than driving, a quick experiment will show that—other things being equal—a slower tempo focuses the ear on the smaller details of a phrase, while a quicker tempo focuses the ear on the longer phrase structure. In choosing their tempo, a performer must choose a personal balance between small details and the long line. Feuermann (like many of his contemporaries, including Heifetz, Toscanini, Horowitz, and Rachmaninoff) usually chose quicker tempi which make the longer phrases more evident to the listener. Slower tempi allow us to linger on details, sometimes with beautiful results, but there is an accompanying cost, as the perception of the longer line is diminished. The use of glissandi (‘slides’) was another distinctive feature of Feuermann’s playing, and another aspect shared by many of his contemporaries. 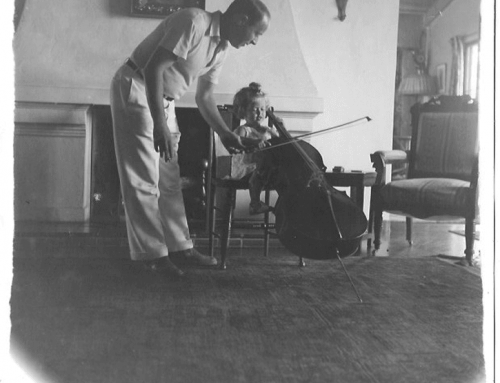 Casals is widely considered to have been the first cellist to liberate the instrument from the heavy glissandi that automatically accompanied position changes in prior generations. 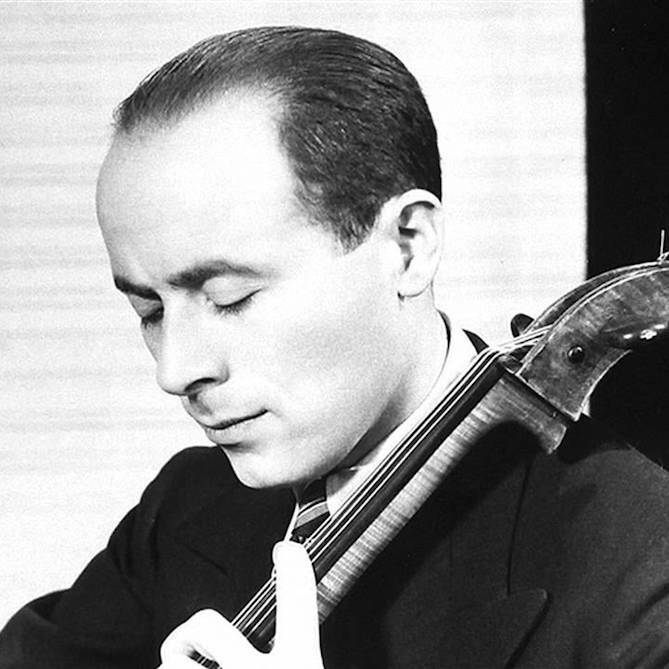 In their time, Casals’ and Feuermann’s playing were considered very ‘modern’ in their cleanliness, using glissandi only where they chose and avoiding them at other times. Yet they both slide far more than almost any modern player. 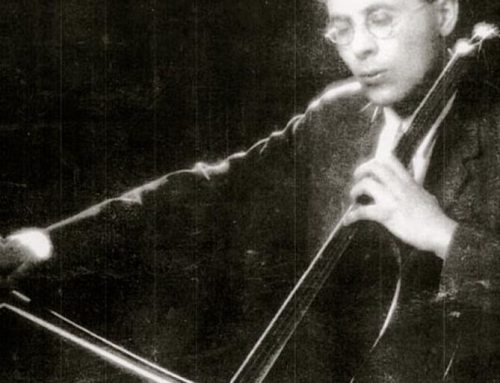 As a student, David Soyer asked Feuermann, “Why do you slide so much?” Somewhat taken aback, Feuermann replied, “The cello is a voice, not a clarinet. You don’t just cover the holes!” Glissandi can bring added emphasis to a note and with Feuermann, the glissandi were frequent but rarely obtrusive. As with most singers, Feuermann’s glissandi were almost never as heavily emphasized as the main note, either in volume or in timing, but rather served as ‘connective tissue.’ In an ascending slide, Feuermann typically created most of the audible glissando only at the very top of the slide, adding emphasis to the arrival note. In his less frequent descending glissandi, he generally brought out the beginning (top) of the glissando, creating a diminuendo effect from the departure note. Both of these choices mimic the natural vocal glissandi heard in many great singers. Many modern cellists, although they generally use fewer glissandi, differ from Feuermann in choosing to use slower and louder glissandi, which are sometimes more emphasized in the phrase than the notes which they connect. It is also not uncommon today to hear a descending slide that emphasizes the lowest part of the glissando, just before the arrival note, an effect nearly unknown in singing. While it is open to debate whether or not string instruments are most effective when imitating the human voice, it is clear that Feuermann’s glissandi closely mirrored those of singers of his era and were generally used lend emphasis to and create a sense of connection between the notes, rather than as dramatic events in their own right. These factors all contribute to, but are insufficient to explain, the most obvious and striking feature of Feuermann’s phrasing. When comparing recordings side by side, it is quickly apparent that Feuermann draws the listener’s attention to a longer melodic line than most other cellists. The faster tempi, rhythmic pulse, lack of vibrato swells or accentuations from non-vibrated notes, and subtle connective glissandi all aid the perception of the longer line. Feuermann’s legato bowing, which connects note to note smoothly, avoiding overly obvious diminuendi and re-articulations at the bow change as well as the random accents and swells that can distort or disrupt a phrase, further aids this effect. And yet all this is still insufficient to satisfactorily describe his phrasing techniques. The real difference is heard not only in the perception of longer lines, but also in the fact that there is a greater sense of dynamic rise and fall and rhythmic push and pull in the melody, and it is this aspect that is the most difficult to describe adequately. 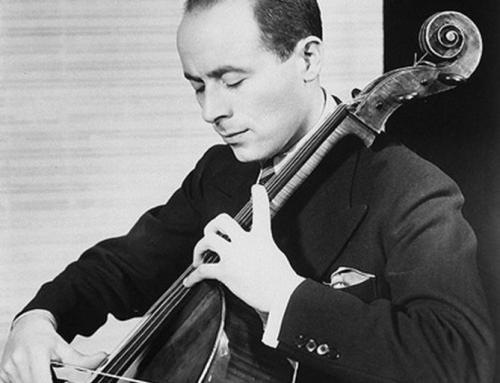 In general, one could say that a cellist playing in what could be considered the typical ‘modern’ style is far more likely to give emotional emphasis to specific single notes—either through vibrato, accent or subito change in tempo or tone color—and thus create sudden, highly dramatic shifts that diminish perception of the longer line in exchange for momentary dramatic impact. Feuermann was more linearly minded, however, choosing to create emotional impact through the push or pull of the tempo and dynamic rise and fall of a sequence of notes that make a melodic phrase or gesture rather than on individual notes. Here the limitations of the written word challenge the ability to describe what is obvious to the listener when performances are heard side by side, but Feuermann’s phrasing emphasized overarching long lines while at the same time also giving greater direction to the shorter melodic sequences within that line. While the players of his era each have unique, distinctive qualities, this common approach to phrasing is shared by many, if not most. I don’t wish for this analysis to cast aspersions on anyone’s favorite performers, This is, after all, a matter of personal presence and the incredible diversity of modern performers gives rise to numerous counter-examples to the necessarily overly broad generalizations made here. But whether one prefers aspects of the modern or older approach, or is equally happy with both, we all benefit from analysis of performers’ phrasing techniques and choices. It does seem possible that certain performer’s phrases are sometimes modified not by plan but by physical habits or carelessness—the habit of beginning vibrato halfway through a note, the tendency to create bow accents or swells for physical reasons rather than musical etc—but no performer’s talent or sincerity is in question. Every musician deserves the chance to make individual choices about how to phrase and what is most beautiful. But phrasing is more than merely reacting instinctually to the feelings the music produces in us when we play, and instinct must be tempered with study and reason, trial and error. It is not enough just to watch a talented player feeling the music very intensely; reaching the pinnacle of musicianship requires more from all of us. Feuermann told his students that as a musician, the most difficult part of learning was to separate yourself from your internal world as you play and to hear what you produce as it actually is—as the audience hears it—rather than as we intend it to sound. Adherents of the ‘golden age’ would argue that producing simple beauty is a very complex undertaking, requiring discipline, education, and self-awareness. We have made great strides in helping our students achieve a considerable level of technical ability. If we can undertake as broad and widespread a conversation on the logic and art of phrasing as we have on the details of technique, perhaps a new golden age is within reach. 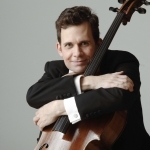 Hailed by Newsday for “extraordinary musicianship…forceful, sophisticated and entirely in the spirit of the music,” cellist Brinton Smith continues to win rave reviews for virtuosic performances with musical ideals rooted in the golden age of string playing. His debut recording of Miklós Rózsa’s Cello Concerto with the New Zealand Symphony Orchestra won widespread international critical acclaim, with Gramophone praising Smith as a “hugely eloquent, impassioned soloist,” and his recording of chamber music of Fauré with Gil Shaham was chosen by numerous critics as one of the year’s best albums. As a chamber musician, he has collaborated with Yo-Yo Ma, Gil Shaham, Cho-Liang Lin, Lynn Harrell, Sarah Chang, Dawn Upshaw and members of the Beaux Arts Trio and the Guarneri, Emerson, Juilliard, Cleveland, and Berg quartets. Mr. Smith is the principal cellist of the Houston Symphony and a faculty member of the Shepherd School of Music at Rice University. He was previously a member of the New York Philharmonic and the principal cellist of the San Diego and Fort Worth symphonies. His performances have been broadcast throughout the world including, in the US, on CBS Sunday Morning and NPR’s Performance Today and Symphonycast. At age 10, Mr. Smith was admitted part-time to Arizona State University, studying mathematics, music and German, and he completed a B.A. in mathematics at age 17. He received his masters and doctoral degrees from Juilliard, studying with renown cellist Zara Nelsova and writing on the playing of Emanuel Feuermann.